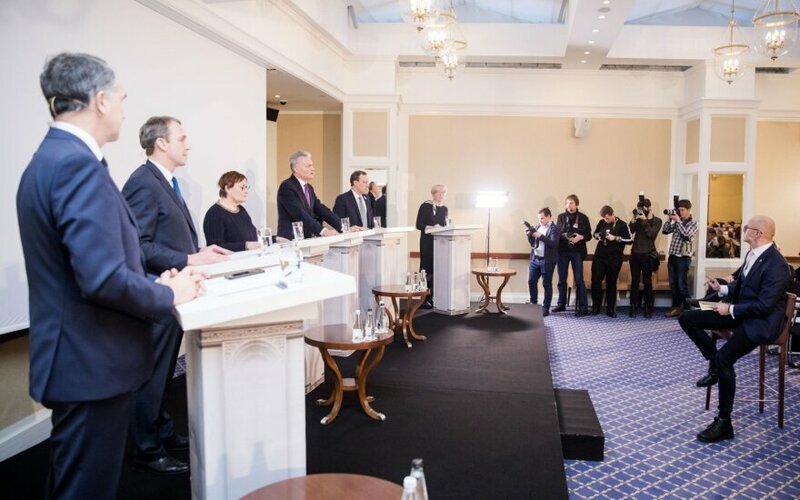 The Eastern Europe Studies Centre organised its fourth Stasys Lozoraitis Annual Lithuanian Foreign Policy Conference, which featured a debate between potential presidential candidates on Lithuania’s position with the European Union resolving fundamental political challenges. The discussion had no lack of laughter and pointed remarks exchanged. The discussion was attended by Gitanas Nausėda, Arvydas Juozaitis, Petras Auštrevičius, Ingrida Šimonytė, Aušra Maldeikienė and Naglis Puteikis. The discussion was held with the aid of the Konrad Adenauer Foundation and Klaipėda Port. Candidates were asked, who should represent Lithuania in the European Council and why. P. Auštrevičius believes that the duty should be shared – foreign and security policy goes to the president, economics – to the prime minister. "I believe that Lithuania has weakened its position when representation was usurped by the president," P. Auštrevičius stated. He is convinced that EU matters are not solely foreign policy and that it is more within the area of economics and that incumbent PM Saulius Skvernelis is not well known in Brussels it not a positive factor. A. Juozaitis stated that the president is established more than she should. "It is what it is, currently the president is leading and I do not see any other chances even in the future because a suitable tradition has not formed," he noted. G. Nausėda believes that the president must be a clear leader in foreign policy and if he was elected president, he would participate in the council personally. However, he believes that the president and prime minister should cooperate more intensively. According to him, the president's results in the international sphere were quite good, however mistakes were made in bilateral relations. When asked how they view the idea of a European army, the potential presidential candidates were mostly doubtful. G. Nausėda stated that just the fact that some EU countries do not belong to NATO would cause difficulties, making coordination unclear. I. Šimonytė believes that as the most important international security organisation, NATO is Lithuania's umbrella. The EU can create added value though, for example in cyber security. N. Puteikis stated he is categorically against a European army, according to him a military unit must have a singular leader. A. Maldeikienė stated that the question should be analysed when considering prospects. She thinks that NATO will remain strong, however the EU could strengthen its capacities. A. Juozaitis stated he believes that France is always on the lookout of how to pass other leading countries such as Germany and this is where such ideas stem from. He believes that the EU may need police forces to manage the threat caused by floods of refugees at the Southern border. Meanwhile, P. Auštrevičius is convinced that Lithuania can never have too many security guarantees. In regard to the EU's future, whether it should move in the direction of federation, the potential candidates' opinions diverged. A. Juozaitis and N. Puteikis were in favour of strong national states. Meanwhile, P. Auštrevičius, G. Nausėda and I. Šimonytė believe that an intermediate variant is needed. A. Juozaitis stated that he is most in favour of Hungarian Prime Minister Viktor Orban's policy focusing on the national state. "With your plan, you want to close the gate to the West and open the gate to the East. Orban is not a politician of the European idea. One must admit that he is a mistaken politician. [...] However, believing that we have resolved all the existential mistakes of Europe is mistaken," P. Auštrevičius stated. "I do not believe that politics is born from desire, politics is born from reality. The idea of the nation is losing its content in a global world and it often turns out to be a matter of desire. [...] An increased convergence of our value bases is inevitable. [...] However, we should learn to manage conflicts," A. Maldeikienė stated. G. Nausėda believes that Lithuania should not close itself off, however he is also not in favour of the US model of strict centralisation. "Typically this model is proposed by large states because they will have a decisive role. I believe in a confederate EU system because when we rush forward, we face phenomena such as Brexit. The idea of the EU is lively only as much as it is flexible," G. Nausėda stated. Meanwhile, N. Puteikis pointed to Jaroslaw Kaczynski's Poland, which according to him, both defends its national values, but is also one of the most pro-European states. "The EU is about freedom, about democracy. We have made the greatest strides is namely those areas, where the EU offered its help. It is clear that attempts to split up into national states is an echo of the times, not understanding complex mechanisms, unfulfilled expectations. Some may think that the answer is federation, but this is not an answer because there are too many interests, I. Šimonytė stated. A. Maldeikienė is convinced that Lithuania should dedicate more attention to the problems of other EU countries and then they will better hear Lithuania's arguments regarding Russia. Meanwhile, G. Nausėda believes that a united response is most important in relations with Russia. "Russia breached Ukraine's territory and at the same time challenged the Western community. We have to react because failure to react would be received as a sign of weakness. The strongest response is a united response. Lithuania, as an expert in relations with Russia, should be more active in this area," G. Nausėda said. P. Auštrevičius stated he is convinced that formal partnership with Russia should have been halted already in 2008 when Russia attacked Georgia. "It is very easy to describe Russia as an enemy, but I would call it a challenge. We must seek democracy in the East. Provocative rhetoric does not always meet support in Brussels," P. Auštrevičius stated. N. Puteikis says that the Russians have a completely different worldview and even with Vladimir Putin withdrawing from presidency, there will not be any significant changes. "We view Russia through the eyes of partisans. Our politicians' statements nowadays remind me of them being partisans, as if there can be no negotiations with Russia. Of course, it is very fascinating to teach the West, how to act with Russia. [...] It is a clash of civilizations," A. Juozaitis said. In regard to Ukraine, whether it could become a member of the EU in the future, the candidates' opinions diverged as well. A. Juozaitis believes that accepting Ukraine into the EU would "implode the union." N. Puteikis says he believes that there should strictly be no further expansion. Meanwhile, I. Šimonytė expressed support for Ukraine's bid for EU membership. N. Puteikis left the audience laughing with his declaration that he bought the Ukrainian military chainsaws with two of his wages, which according to the politician will be needed in defending Mariupol from Russia. He stated that there is no greater friend of Ukraine in Seimas and even was somewhat angered that the audience is laughing at his aid to the country. In terms of migration problems, according to N. Puteikis, there is no such thing as war refugees because military action is not ongoing anywhere. In Syria, he notes, chemical attacks and other military action continued up to September 2018 when R. T. Erdogan did not agree to allow Russian President V. Putin to attack Idlib province, where the last rebel bastion stands. A ceasefire was announced, which continues to date. P. Auštrevičius made use of this opportunity to point out that N. Puteikis spoke about Syria "like Putin" and that the politician was mistaken that there is no more military action ongoing there. Facebook entries or live meetings: what will help win the presidential elections?